The High Court today took strong exception to the failure of the government to unearth the organised racket of grabbing public jobs through fake Scheduled Tribe certificates, and directed it to establish special courts within one month to deal with this grave problem. Tension seems to be brewing up here following the announcement of Joint Trade Union Council to observe a state-level industrial strike here tomorrow in protest against the police action on the employees of Honda Scooters in Gurgaon on Monday. The Delhi University Teachers Association and the Jawaharlal Nehru Teachers Association have condemned the police action on workers in Gurgaon on Monday. The DUTA and DUCKU (Karamchari Union) have announced a one-day university bandh on August 1 to register their protest. Thousands of posts of primary teachers have been lying vacant in MCD schools for the last few years, affecting the studies of the students. The Delhi government is planning to upgrade four major hospitals of Trans-Yamuna area in view of the Commonwealth Games in 2010. A city court today extended the police custody of drug mafia Sharafat Sheikh, against whom stringent MCOCA was invoked, by 3 days. Additional Sessions Judge J M Malik allowed custodial interrogation of Sheikh till July 30 as the investigating officer said the accused was to be taken outside Delhi for ascertaining his assets and inter-state contacts. Joginder Fauji, alias Lala Fauji, a member of Sunder Bhatti gang, was shot dead in Roza-Jalalpur village under Bisarakh police station by armed criminals, while he was going from Jalapur to Roza in a Maruti car. A homoeopath was deprived of gold chain valued at Rs 12,000 while she was walking towards her house in Sector-9 here just opposite the main market. With the arrest of 5 persons, Delhi Police claimed to have worked out 12 cases of robberies and burglaries committed in Mehrauli and Nangloi areas. Delhi Police have arrested two persons allegedly involved in a number of cases of murder, attempt to murder, extortion and contract killing. The incident happened in broad daylight. The Expenditure Finance Committee has cleared five projects belonging to Forest, Health and Family Welfare, Law and Justice departments and two PWD projects amounting to Rs 23 crore. A few days after Delhi Chief Minister Ms Sheila Dikshit admitted that there were water leakages in the Capital’s water supply lines, the Delhi Jal Board today accepted that about 80 million gallons of water is lost each day through its supply lines out of a total production of 675 mgd. 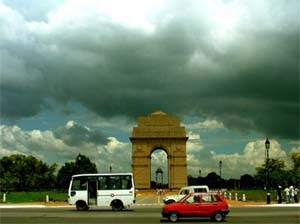 Delhi Police issued over 1600 notices erroneously for violation of traffic rules in the first half of this year. In a written reply in Lok Sabha, Minister of State for Home Affairs S Regupathy stated that Delhi Police issued 15,31,455 notices for violation of traffic rules between January one and July 15 this year, against which 3241 complaints were received. Out of five National Petroleum Management Programme awards bagged by the Indian Oil Corporation, two have gone to the Research and Development Centre of the IOC located here. Out of a total of 1,236 cases presented to the District Lok Adalat, 440 cases were decided on the spot by officiating District Judge Bharat Bhushan. The court also ordered the payment of Rs 3,39,240 as compensation to the affected parties. Delhi Police have arrested a person for allegedly possessing spurious drugs and medicines worth Rs 2 lakhs. The accused has been identified as Harish Singhal (32), a resident of Ghaziabad, UP. A division bench of Chief Justice B C Patel and Justice S K Kaul asked the authorities to create these courts to benefit the vulnerable sections of the society. The order came after P N Gera, Director, Ministry of Personnel, sought one month time to create such courts for the speedy disposal of such cases. A week back, the court had made it clear that it would like to see that the cases were tried as soon as possible, preferably within three months. The bench also issued a notice to the Chairman of the ST commission to give its reply by September 14, the next date of hearing. The chief of the commission was also directed to assist the court in the matter. The Central Bureau of Investigation (CBI) through its counsel informed the bench that it had already initiated action in 37 such cases and already framed the charges in four. In 12 such cases the framing of charges were in the pipeline, informed the CBI counsel. “Had there been special courts there would have been expeditious trials,” observed the judges. Earlier, the court was informed through an affidavit that the decision was taken to set up a coordinating mechanism under the chairmanship of M L Sharma, the Additional Director of CBI for the purpose. Earlier the court had asked the Centre to provide sufficient manpower to the CBI if the need arises to look into the matter by the investigating agency. The court took strong objection to the inaction of the government as the cases were pending before the court since 2003, despite the findings of the investigating agency that nearly 30 per cent of the jobs in central and state governments had been grabbed through the fraudulent means of fake certificates. Mr Harish Gulati, counsel for CBI had submitted that there were nearly nine thousand cases for such fraud for which 2400 inquiry officers and 1700 inspectors were required. CBI had informed the court that it had registered 22 cases involving 37 persons and five chargesheets had already been filed in a Special Court at Karkardooma here and that it would file chargesheets in 16 more cases by the year end. The court is seized of a PIL alleging a job scam wherein thousands of posts reserved for STs were fraudulently secured by unscrupulous persons belonging to the general category on the basis of fake and forged certificates. Taking a serious note of allegation levelled in the PIL filed by one Chandeshwar Prasad, the court had asked the CBI to probe all such cases between 1995-2000. The administration has imposed Section 144 and warned of strict action against any move to create violence. The Joint Trade Union Council consisting of the major labour unions, including CITU, AITUC, Hind Majdoor Sabha (HMS), Sarva Karamchari Sangh (SKS), INTUC and the Bhartiya Majdoor Sabha (BMS) held a meeting here yesterday and today to announce the detailed programme of the protest. A council spokesperson said that a state-level strike would be observed on July 28 and all industrial and factory workers affiliated to these unions would stay off work on Thursday in protest against the ‘barbaric’ police action against factory workers in Gurgaon. Alleging that both the state and union governments had failed to implement labour laws and rules in multinational corporations, he said it was the latter which had been dictating terms to the government and exploiting workers. He said imposition of the Section 144 would not deter the industrial workers from demanding their rights and the council would be staging a big procession in the town tomorrow evening. The council has sought strict action against the district officials of Gurgaon, including the Deputy Commissioner and the SSP besides monetary compensation of Rs 1,00,000 to the seriously injured and Rs 50,000 to those who received injuries in the incident. It asked the Honda Scooters management to reinstate the sacked workers and give an undertaking not to harass the workers in future. The Deputy Commissioner of Faridabad, Mrs G.Anupama, in a press release, has announced imposition of Section 144 in the city and the district and warned against any attempt to disrupt the industrial peace. Special duty magistrates have been appointed in various areas in the town to ensure law and order. The Delhi University Teachers Association and the Jawaharlal Nehru Teachers Association have condemned the police action on workers in Gurgaon on Monday. The DUTA and DUCKU (Karamchari Union) have announced a one-day university bandh on August 1 to register their protest. Meanwhile, JNUTA today strongly condemned the ‘brutal’ treatment of workers by the police. It was pointed out that the task of the police is to subdue violence with the minimum possible force, not to use force to cause the maximum hurt to the unarmed protesters even after they are down on the ground. The shocking use of strong arm and violent tactics by the police on the workers is in clear violation of the workers’ right to protest in a democracy, JNUTA added. The Leader of Opposition in the MCD, Mr. Subhash Arya alleged that posts of 2, 367 teachers and more than 1000 head masters are lying vacant in different primary schools of the corporation, which is doing nothing in the matter. While addressing a conference, he said that crores of rupees of education budget had lapsed last year but authorities concerned failed to appoint the teachers which was important for the future of the students who came from poor families. They had reported the matter to Delhi Subordinate Selection Board of the Delhi Government for fill up the vacancies but so far nothing has been done. Because of lack of adequate teaching staff and other facilities, education standard of MCD schools is poor. This issue has been raised a number times in the Standing Committee a well as in the House Meeting but it has fallen on deaf years of the Congress-ruled corporation, Arya alleged. Regretting the pathetic condition of schools, he said 54 schools are still without electricity. Thirty schools have no provision of potable water and 16 schools do not have ‘pucca’ toilets. He said under the plan head for education an allocation of Rs 130 crore was made during 2003-2004 and Rs 135 crore was made in 2004-2005. Similarly finance for non plan head during the respective years were Rs 433.23 crore and Rs 515 crore under plan head. But due to lack of coordination between Delhi Government and the Corporation, no utilization could be made of Rs 52 crore during these years under plan head and Rs 200 crore under non plan head, he claimed. The Delhi government is planning to upgrade four major hospitals of Trans-Yamuna area in view of the Commonwealth Games in 2010. These include Guru Teg Bahadur Hospital, Dilshad Garden, Lal Bahadur Shastri Hospital, Khichripur, Dr Hedgewar Hospital, Karkardooma and Rajiv Gandhi Memorial Hospital, Kalandar Colony. According to a senior officer of the Health and Family Welfare Department of the Delhi government, Rs 25 crore have been sanctioned for the whole project. “Recently, a five-member team consisting of top officials of Home Ministry, Central Urban Development Ministry, Delhi Urban Arts Commission and Health and Family Welfare Department of Delhi government had been set up to study this project. After studying it from various angles, these hospitals were selected,” he said. Because of the intense patient pressure on Guru Teg Bahadur Hospital and Lal Bahadur Shastri hospital, the committee suggested an addition of beds in both these places. At present, the Lal Bahadur Shastri Hospital has 200 beds. Another 300 beds will be added to the hospital, for which 8,000 square feet of vacant land just behind the hospital has been ear marked. The Delhi government has recently handed over Rs.1 crore as an advance payment to the Delhi Development Authority (DDA). However, one obstacle in the way of the project is the presence of some high-tension wires over the vacant land. Apart from extending the bed capacity, some other features like Trauma Centre, automatic operation theatre, computerised OPD, air conditioned CAT ambulances will also be added to the hospital. All old instruments and machines of the hospital will also be replaced. Blood Bank, IUC, automised communication system like features will be added to the Dr. Hedgewar Hospital and Rajiv Gandhi Hospital. The parking facilities will be improved at all four hospitals. According to the president of the IMA, East branch, Dr. Arun Goyal, all staff including doctors and nurses of these hospitals will be given special training to handle patients during the time the Games are on. They will also adhere to a dress code. “The government is also planning to hire some foreign doctors from countries like the USA, France, Switzerland, and Britain specially for the Games,” he said. A city court today extended the police custody of drug mafia Sharafat Sheikh, against whom stringent MCOCA was invoked, by 3 days. Additional Sessions Judge J M Malik allowed custodial interrogation of Sheikh till July 30 as the investigating officer said the accused was to be taken outside Delhi for ascertaining his assets and inter-state contacts. The prosecution had sought 7 days police custody of Sheikh but the court said that “enough remand has been granted to the police; now in the interest of justice no more custodial interrogation will be allowed after this”. Special Prosecutor K K Singh informed the court that the last 15 days of custodial interrogation helped the police in recovering several valuables collected by the drug don through ill-gotten money. “We have been able to recover five cars including an expensive ‘Farrado’ and properties in Mumbai and in Delhi worth more than a crore belonging to accused have been ascertained,” Singh said. Sheikh allegedly secured a fake election identity card and arms licence from Bareilly in Uttar Pradesh and he had properties and associates there, the prosecution said, asking that it needed more time to take him to Bareilly, Manali and some places in Madhya Pradesh. The court rejected Sheikh’s plea, made through his advocate, that the case under section-3 (punishment for organised crime) of the Maharashtra Control Of Organised Crime Act (MCOCA) was not made out against him as proper sanction of officer not below of the rank of ACP was not taken. Joginder Fauji, alias Lala Fauji, a member of Sunder Bhatti gang, was shot dead in Roza-Jalalpur village under Bisarakh police station by armed criminals, while he was going from Jalapur to Roza in a Maruti car. He was rushed to Ghaziabad’s Yashoda Hospital, where he later died. According to sources, the murder of Lala Fauji may plunge the area into a gang war once again. Notorious ganglord Sunder Bhatti’s lieutenant and a sharpshooter, Joginder Fauji, alias Lala Fauji, was done to death in broad daylight on Tuesday. After the murder of a rival gangster Naresh Bhatti, Sunder Bhatti and his gang members have been fearing for their lives. It is felt that Sunder Bhatti’s days are numbered. Earlier, half a dozen sharpshooters of Sunder Bhatti’s gang were killed either in gang war or in encounters with the police. Realising the lurking danger to his life, Sunder had managed to get the ‘protection’ of a jail. With Fauji’s death, it is talk of the underworld that Sunder Bhatti gang has become further weak. The murder of Fauji has also raised questions on the efficiency of police. The police of three states were said to be hounding him, but the criminal was moving freely in his car. Fauji’s weapons were also understood to have been looted by his assailants. The police fear that the latest murder may revive gang war during the run-up to the panchayat elections. The incident happened in broad daylight. According to the complaint lodged with the police, the incident happened when the victim, identified as Mrs Sangeeta Bhasin, was going to her residence at house number 128 in Sector- 9 around 12.45 pm today. She said someone came from behind and pulled off her chain after pushing her down on the road. The youth was wearing a black T-shirt. After snatching the chain, he ran towards the spot where his accomplice had been waiting on a motorcycle just a little distance away. The duo sped away before the victim could note down the registration number. She received minor injuries in the scuffle. In another incident, some persons attacked a temple priest at Badram village in the district and looted about Rs 30,000 after beating him up. The accused have been identified as Mehraj (24), Qayoom (26), Sallauddin (23), Rohul Amin (23) and Mohammed Litten (27). Police said that the incidents of robberies and burglaries were committed in December and January in the year 2004-2005. Police said that during interrogation, the accused revealed that they purchased one Tata-407 and a Canter tempo to allegedly steal iron pipes and iron sheets from the factories. Their modis operandi was simple. They would scale the wall of a chosen factory, overpower the watchmen at knifepoint, and load the goods on the two vehicles before making good their escape. In case anyone resisted, they would stab him. Yesterday, the police got the information that the gang would assemble near Madanpur Khadar at 7.30 pm. The police laid a trap and arrested the gang. Two knives were seized from their possession. Delhi Police have arrested two persons allegedly involved in a number of cases of murder, attempt to murder, extortion and contract killing. They have been identified as Jagvinder alias Jaggu and Brij Pal Bhainsla alias Pintu. Police said that a reward of Rs. 10,000 had been announced for the capture of the two criminals some time back. They are the active members of Madan Bhai gang and were suspected of having committed several heinous crimes in the Capital. The Special cell of Delhi Police got the information that the duo would be coming to the Tihar Jail area on Tuesday morning. A trap was laid in the area. At around 8.30 am, the two men arrived at the spot on a motorcycle and were nabbed after a brief encounter. The police recovered arms and ammunition from their possession. They were produced in the Patiala House courts today which remanded the duo to police custody. The Expenditure Finance Committee (EFC) has cleared five projects belonging to Forest, Health and Family Welfare, Law and Justice departments and two PWD projects amounting to Rs 23 crore. Delhi PWD Minister Dr A K Walia, who chaired the meeting, said that the Committee has given a nod to a proposal of Forest department pertaining to extension of Rehabilitation of Bhatti Mines through Eco-Task Force for another 3 years in co-ordination with Delhi Government. In this regard, the Eco-Task Force of 132 Infantry Battalion has been carrying out plantation in Bhatti Mines of Asola Bhatti Sanctuary. The EFC has also cleared a project relating to the construction of an Arrhythemia Centre in G B Pant hospital at an estimated cost of Rs 680.93 lakh. The multi-facility centre will solve the problems of patients suffering from heart diseases, said Dr Walia. Three other projects include a proposal for providing additional facilities to Law department, construction of a Road Under Bridge to connect road No 58 and 64 and renovation of the Delhi Assembly Hall and its surrounding areas. Sources said that to prevent, detect and repair leakages, the Jal Board has constituted a dedicated Leak Detection Cell. According to an official, the major points of the leakage in the 9000-km long distribution system were the service connections by the consumers and unauthorised use of online boosters. While seepages were reported from different places all over the city, regular inspections were carried out by board officials on daily basis to plug these leakages. Though most of the pipelines were 40 to 50 years old, their longevity was being increased by preventive maintenance besides being replaced in a phased manner. Delhi Police issued over 1600 notices erroneously for violation of traffic rules in the first half of this year. In a written reply in Lok Sabha, Minister of State for Home Affairs S Regupathy stated that Delhi Police issued 15,31,455 notices for violation of traffic rules between January one and July 15 this year, against which 3241 complaints were received. On the basis of these complaints, 1634 notices have been withdrawn as after enquiry it was found that these had been issued erroneously. He said the error occurred as traffic police personnel were not able to record correctly the make, colour, registration number etc of the vehicles. Delhi Police is in the process of amending the software presently in use so as to avoid issue of such erroneous challans. The House was also informed, in reply to another query, that 39,65,845 challans were issued in 2004, compared to 33,92,309 in 2003. Out of five National Petroleum Management Programme (NPMP) awards bagged by the Indian Oil Corporation, two have gone to the Research and Development Centre of the IOC located here. The Indian Oil’s R&D Centre here bagged the prize of Excellence in Creativity and Innovation for the development and commercialisation of a novel process technology for removal of Hydrogen Sulphide (H2S) and Mercaptans from LPG through continuous film contractor. Out of a total of 1,236 cases presented to the District Lok Adalat, 440 cases were decided on the spot by officiating District Judge Bharat Bhushan. The court also ordered the payment of Rs 3,39,240 as compensation to the affected parties. The administrative and judicial officers of the district, including Special Judge Anroodh Singh and ADJ Subha Singh, took part in the court proceedings. Mr Umesh Chander, Secretary of District Legal Services Authority, said some eminent citizens and social workers had also attended the proceedings. In the end, the District Judge and Secretary, Legal Services, had thanked the distinguished gathering.